Here are a few of the structural forms created around some of Sandy’s memories. 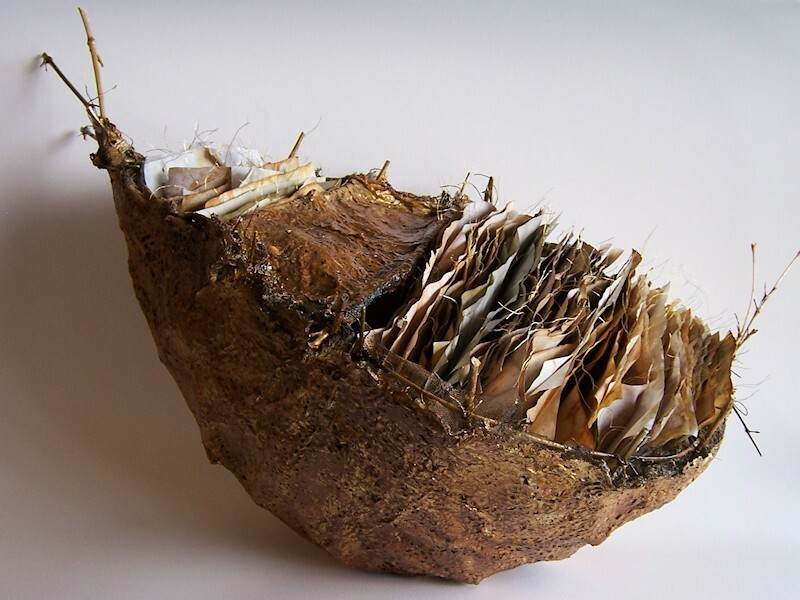 This boat-like sculpture was the first of several made for an exhibition titled, Temporary Shelters. I wanted this one to have the burden of sheltering pages and pages of slightly recalled memories. The kind of memories that we feel we need to drag through our lives because they somehow define us. And every once in a while something will make us recall just exactly who we are and where we came from, so we tug on those connected threads and remember. 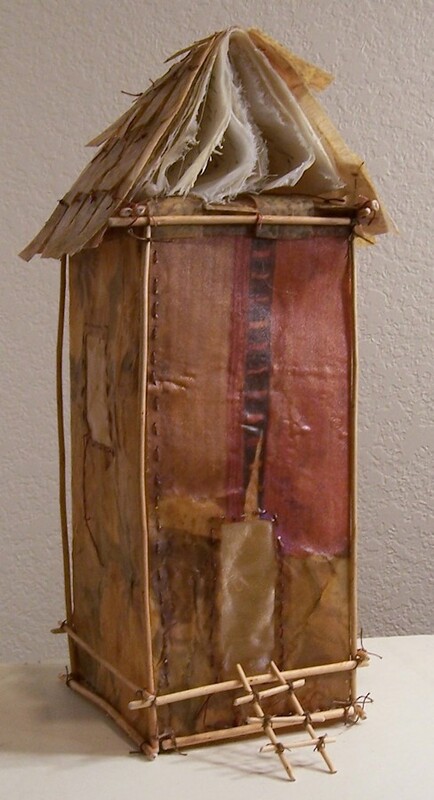 This is one of my favorite pieces made from the “skins” I constructed using various layers of thin fabrics fused and sanded and drawn on. After that they were waxed, polished and cut into shapes to be stitched and fabricated into vessel forms. 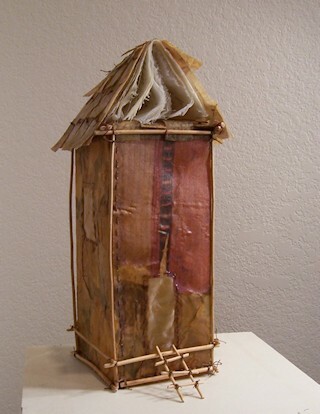 Storied House is supported with willow stems and keeps its own story hidden between bound pages of cloth up in the attic. Where else? 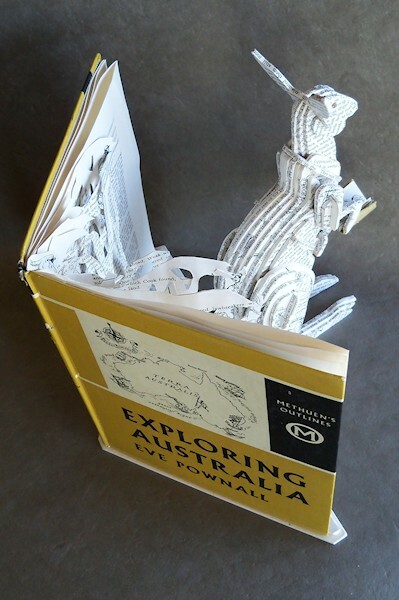 Exploring Australia is the top award winner for the Waterhouse Natural History Art Prize –Sculpture in 2011. The old children’s book was a gift from my students in Stanthorpe, Queensland. Pen and ink drawings interspersed the pages of text by author Eve Pownall. Once opened near the center those pages became the back drop of a pop up Eucalyptus forest. Galahs hover in the tree tops as a completely text-covered kangaroo comes forward reading a miniature of the same book to her joey in the pouch.